Pay TV operator M7 Group has launched a new hybrid IP and DTH service in Germany. The new platform, Diveo, will target the 17 million homes that receive satellite signals via the Astra satellite position at 19.2° East. The Diveo offering comprises up to 70 channels in HD quality and over 30 catch-up libraries alongside video-on-demand titles. Enhanced TV applications such as pause live TV, restart and cloud-based DVR are offered via IP, while an app will make content available on TVs, tablets, smartphones and the web. The programming line-up includes 20 premium channels. Customers who opt for the Erlebnis Paket can access over 50 HD channels for €7.90 per month, including all public German channels in HD quality as well as commercial channels RTL HD, ProSiebenSat.1 HD, Vox HD, RTL II HD, Eurosport 1 HD, Sport 1 HD und Nitro HD. Customers also have access to interactive applications and access to catch-up TV, as well as access on other devices via the app. The Entdecker Paket, which costs €11.90 per month, provides customers with above services as well as access to three premium channels, with the option to change the selection every month. Satellite TV households choosing the Vielfalt Paket for €16.90 per month will have access to above mentioned packages as well as more than 20 premium channels such as Fox HD, Sony Entertainment TV HD, Universal Channel HD, SyFy HD and Planet HD. The service is available via set-top box connected to the local area network or via a CI+ module. “With the launch of Diveo, M7 has introduced a TV product that is tailored to the needs and changing habits of today’s TV consumer. Linear TV still represents a large portion of the current TV consumption. However, there is growing demand for video on demand and IP-based interactive services. 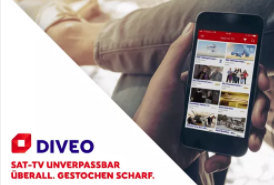 And at the same time, consumers are increasingly tapping into TV content via smartphones and tablets,” said Oliver Rockstein, EVP of the M7 Group responsible for Diveo. Programming partner ProSiebenSat.1 is distributing free TV channels ProSieben, Sat.1, Kabel Eins, Sixx, Sat.1 Gold and ProSieben Maxx in HD quality via satellite. The group’s three pay TV channels ProSieben Fun HD, Sat.1 Emotions and Kabel Eins Classics are also distributed via Diveo. “For the first time, our partner M7’s new consumer offering provides the opportunity to use our HD stations, pay TV offerings and extensive hybrid services such as catch-up offerings via satellite from a single source. We are thus expanding our viewers’ opportunities to receive our content via an additional distribution channel,” said Christof Wahl, chief digital entertainment officer and COO of ProSiebenSat.1. M7 Group has been mulling the launch of a German pay TV platform since its acquisition of the Kabelkiosk B2B platform from Eutelsat in 2014. M7 Deutschland managing director Kees Farber said at the time that the group was looking into a direct-to-consumer launch.